Buying a child's first bike is an exciting and memorable time for parents and kids alike. Besides choosing a style the child likes, there are several other factors parents need to consider for their young one to have a safe, comfortable and age-appropriate bicycle. Although buying that first bike is a special time, it can be difficult to know what is right for the little rider. Take the guesswork out of this milestone by knowing what to look for. According to the San Francisco Bicycle Coalition, learning to ride on a balance bike, rather than learning to ride with training wheels, is easier and more intuitive. Children starting out with training wheels must learn how to balance once they come off whereas those training with a balance bike have already developed that skill. It does not have pedals, but the child uses his or her feet to move. This type of bike helps toddlers and preschoolers develop the movement required for the pedal-version. The wheel size is also an important factor. Appropriate wheel size will depend on both the child's age and height. Another way to determine correct sizing is to use the inside leg length, or inseam. Two types of brakes are available for youth bikes: coaster or pedal brakes (engaged when the child pedals backwards) and handbrakes (engaged by handgrips that trigger the braking mechanism). There are styles that feature both types of brakes. According to the International Bicycle Fund, a nonprofit organization dedicated to promoting bicycling, buying a child's bike with either pedal or both pedal and handbrakes is best. Young children may not have the hand strength necessary to stop a bike using only handbrakes. The seat post and handlebar stem should also be tightly bolted and the saddle should be comfortable and supportive for the young rider. Chain guards are an important safety feature for young learners. These cover the bike chain and prevent pant legs and shoelaces from getting caught. Most new model bicycles will include these; however older styles may not, so be careful if you're purchasing your child's bike secondhand. Suspension can absorb shock and provide added control, but it also adds extra weight. 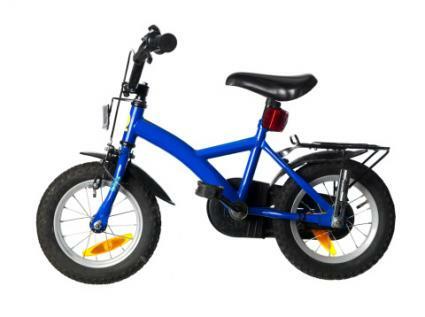 Children's bikes typically come with rigid, or no suspension, or front suspension. Some styles, such as mountain bikes, may have full suspension, which offers greater control and added shock absorption. Parents will need to consider the age and abilities of their child when considering this feature. A younger child may be fine with rigid suspension and appreciate a lighter bike while an older one might be more comfortable with a model that has front or even full suspension. Many starter kids' bikes are single speed, so they do not have any gears. Other styles, especially with larger wheel sizes, may come with five or more. The adjustability can be helpful as children become acclimated to riding and begin tackling hills and faster speeds. Gear shifters are available in a twist or a trigger style. Beginner bikes vary widely in cost, from around 35 dollars to over 200 dollars. It doesn't have to be the most expensive bike on the market to be good quality and appropriate for the child. However, making sure the bike has the correct safety features, is comfortable and is the correct size is essential. While parents might be tempted to get a bigger size or larger wheels to save money by not having to purchase a bike in the future, this is a big mistake. If it is too large, it will make the bike unmanageable for the child, and ultimately, unsafe to ride. Children don't always want to wear a helmet, but it's the first rule in biking safety. Letting the rider choose his first helmet can make the experience more fun. Wearing a helmet from the very first time he gets on a bicycle also makes it a natural step when getting ready to ride. 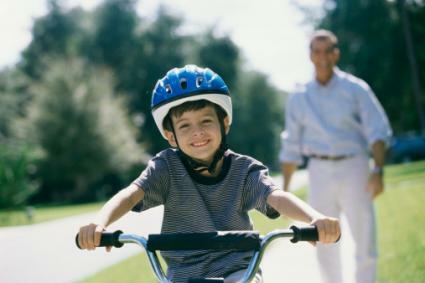 Besides wearing a properly fitting helmet, parents should take several precautions to make sure their little one is safe. Safe Kids Worldwide suggests when children ride, they wear bright colors, ride on the sidewalk if possible and use hand signals. Parents should also check the bicycle each time before the child gets on it to make sure there is no damage to the bike and the tires are properly inflated. Getting a first bike is a memorable moment, but can come with questions and concerns. Ensuring the bike is the correct size, and selecting the right safeguards, features and style for the new rider is important. By taking into account these considerations, she will have the best bike for creating memories and new adventures.